Zach and I wrote a book! 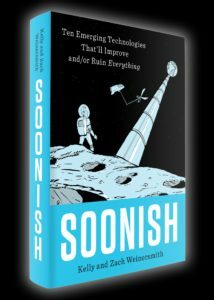 Soonish: Ten Emerging Technologies That’ll Improve and/or Ruin Everything explores 10 emerging technologies, and discusses the roadblocks standing in the way of each technology, why it would be awesome if these technologies were part of our everyday lives, and ways in which things could go horribly wrong if these technologies were widely available. We take deep dives into each of these topics, and did our best to explain complicated scientific topics in ways that don’t require the reader to have any scientific background. We also tried to make it funny. Zach drew over 100 comics for the book, and we included funny/weird tangents at the end of some of the chapters to explore wild things we stumbled across while doing our research. The book is coming out in the US through Penguin Press, and will be released in the UK (and a bunch of other countries) in the coming months. Right now we’re taking pre-orders, and the book will hit stores in mid-October. Pre-orders are super important for things like trying to get on the New York Times bestseller list, so if you’re interested in getting the book we would be super appreciative if you would consider ordering it now rather than later. PLUS – we’re currently #4 on Amazon’s list of best-sellers at the moment. Number 1 right now is George W Bush’s new book, and we would be tickled if we could bump a former US President out of the #1 position. We’re also doing bonus stuff associated with preorders. For example, Zach is drawing extra SMBC comics when we pass certain benchmarks. For folks who preordered, there are also exclusive rewards that will go only to them (like ebook copies of Zach’s prior books). We’re really excited about how the book came out, and we hope you’ll enjoy it. Here is a link to the book’s webpage. Excellent! Will an Audible version be made available? Maybe even narrated by WiI Wheaton? Pretty please! Yes, it will! We don’t know who the narrator will be yet, but we’ll definitely announce it when we do!